Engineered to deliver your longest shots with confident precision, the BLACK FX1000 is set to raise eyebrows and expectations among long-range shooters. Competition-ready straight from the box, BLACK FX1000 integrates renowned Nikon optics into its first focal plane optical system for tack-sharp images and dialing functionality at any magnification and distance. Proprietary new glass-etched tactical reticles paired with precise, high-speed turrets allow fast, repeatable distance corrections and intuitive hold-off points. And for rapid return to your zero, the FX1000 debuts Nikons all-new BLACK Return-to-Zero integral zero-stop in the elevation turret. Sunshade included. The 4-16x50SF is a dedicated precision riflescope that offers the precision, the features and the ruggedness serious shooters demand. For starters, it is built with an aircraft grade aluminum alloy 30mm main body tube. With a choice of X-MOA, Illuminated X-MOA or Illuminated X-MRAD reticle, the riflescope delivers 90 total MOA internal adjustment travel for the X-MOA reticle and 25 MRAD for X-MRAD reticles. 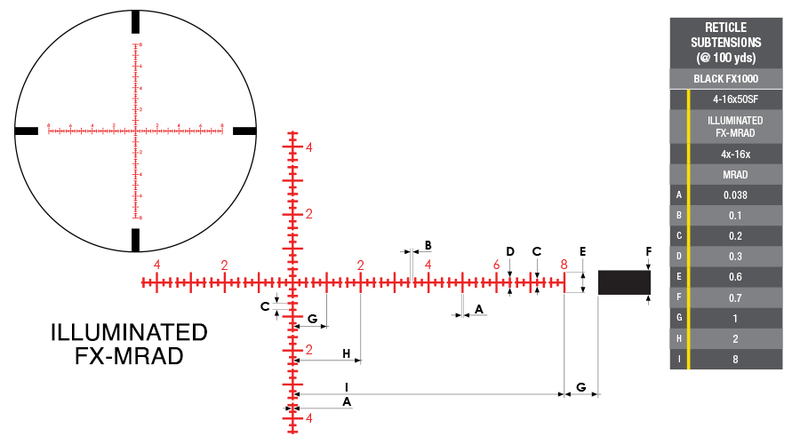 Its turrets have 1/4 MOA or .1 MRAD click graduations yielding 12 MOA / 5 MRAD per revolution depending on variant.